Gaura flowers catch attention as the plant that always looks great in your brown thumb neighbor’s yard. Its waving wands dotted with dozens of pinkish flowers don't stop blooming in triple-digit temperatures or dry weather that turns lawns crisp. Get to know this low-maintenance perennial that may give coneflower a run for its money in the cultivated wildflower popularity contest. If the name gaura doesn't roll off the tongue, it helps to remember the Greek origin of the word gauros, which means superb. Also known as wandflower, whirling butterfly, and bee blossom, Gaura lindheimeri can range from 15 inches to four feet tall, but most new cultivars are bred to be compact and container-friendly. One of the best features of gaura plants is the long bloom time, much longer than most perennials. The heaviest blooming occurs in early summer, but you can expect flushes of flowers to recur throughout the summer and into fall in USDA growing zones 5 through 9. Gaura foliage is lance-shaped and often tinged with pink, cream, or gold, depending on the variety. Wiry flower stems bear many 1-inch flowers with four petals each. Flowers are white, pink, or a combination of the two. The long taproot that makes gaura so drought-tolerant also makes it difficult to transplant successfully, so choose your planting site carefully. Gaura thrives and blooms best in full sun but will tolerate some afternoon shade, particularly in hot climates. Along with plenty of sunshine, excellent drainage is the key to success with gaura. They aren’t the longest-lived perennials in any case, and wet winter soil is a sure way to kill these drought-tolerant natives. Amend the soil with a mix of compost and grit or, better yet, plant them in raised beds. Space the plants at least 12 inches apart, and plant in groups of three or five plants for maximum impact. Water gaura infrequently but deeply to help the plants establish their deep roots. Gaura thrives in poor soil and doesn’t need supplemental flower fertilizer. Too much manure or fertilizer can make the plant floppy. Cutting back the stems of gaura after the first main bloom will encourage a tidy plant and spur repeat blooming. If you want to propagate your gaura plants, just wait for the following season, when new seedlings will emerge from these self-seeding plants. Division is tricky due to the long tap root, and plants shouldn’t need dividing to stay vigorous. If you can’t get your gaura plants to overwinter reliably because of soggy soil or below-average temperatures, the long-flowering season and compact growth habit of gaura make it a worthwhile investment as a container plant. The airy texture and form of gaura make them lovely accent plants in a mixed perennial border. You can plant masses of them in the wildflower garden, where they will demonstrate how they got the nickname “whirling butterflies” as they dance in the breeze. Gaura plants may flop over in the garden, and while staking is always an option, you can use supportive companion plants that will keep the flower spikes out of the mud. Rigid, upright flowers like yarrow, 'Autumn Joy' sedum, or liatris have similar growing conditions and blooming times. A trio of butterfly weed, globe thistle, and gaura is a stunning combo in a dry garden that will bring the pollinators by the score. Corrie’s Gold: The gold in this plant refers not to the flowers, but to the marvelous variegated foliage. Flowers are white tinged with pink. Crimson Butterflies: Bright pink flowers on red stems hover above burgundy foliage. Partner them with blue or green-flowering plants for a head-turning combination. Passionate Rainbow: As if the pink flower wands weren’t enough, the foliage is also edged in pink. Siskiyou: The most common variety in the trade, these are named for the Siskiyou Rare Plant Nursery in Oregon, which bred the plants. Sparkle White: This is a Fleuroselect Gold Medal winner. 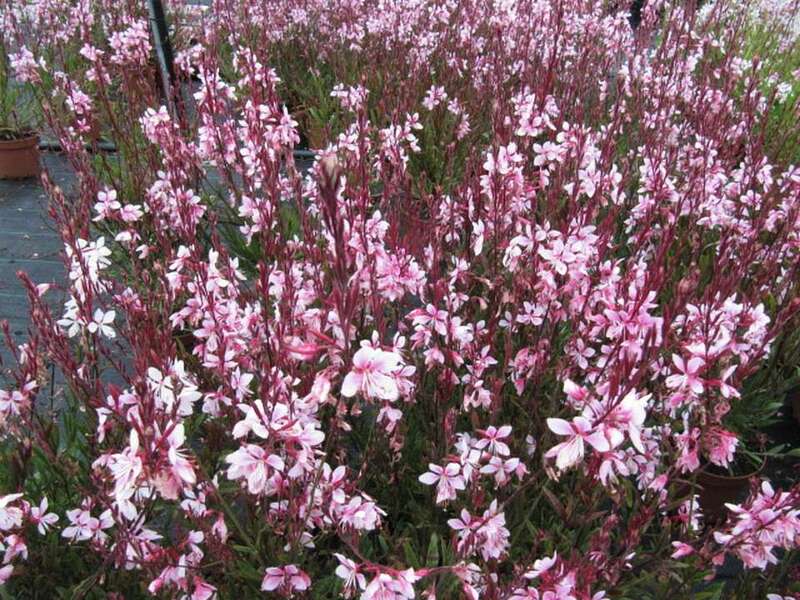 Gaura plants don't suffer from many insect pests, but when plants are stressed by excessive drought or overcrowding, they can be vulnerable to aphids, flea beetles, or whitefly outbreaks. You can make your flower garden less welcoming to these pests by removing dead plant matter that insects use to overwinter in at the end of the growing season, keeping your flowerbeds weeded, and attracting parasitic wasps with a companion planting of sweet alyssum.